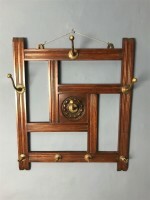 A Victorian mahogany and brass hat rack circa 1880 in the Aesthetic movement style. 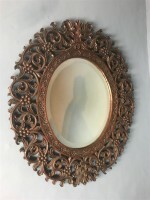 21 inches wide 5 inches deep 25 inches high. 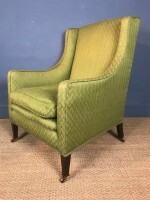 An Edwardian mahogany wing armchair circa 1910 covered in green in excellent solid condition. 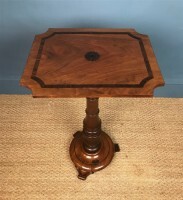 A William IV mahogany lamp table circa 1835 the rectangular top with re entrant corners stellar inlay to the centre and rosewood crossbanding on turned column and circular base. 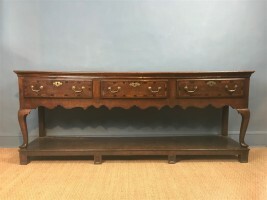 A rare George 111 oak Minsterley Dresser Shropshire circa 1760 with the classic design unique to the village of cabriole legs on a pot board base. Formerly with rack. 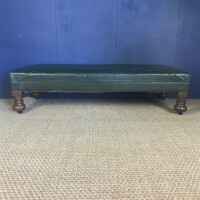 A large Victorian walnut stool circa 1860 covered in the original green oilcloth. Read more: A large Victorian walnut stool circa 1860 covered in the original green oilcloth. 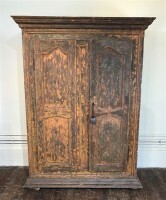 A late 18th century painted Alsace cupboard circa 1800 with a pair of shaped arched doors. 56 inches wide 20 inches deep 75 inches high. 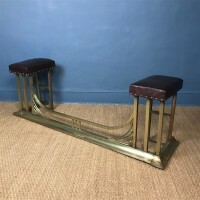 An Edwardian brass club fender circa 1910 with original brown leather seats to each side . 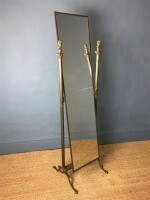 An Edwardian brass cheval Mirror circa 1910 the sides surmounted with rampant lions . 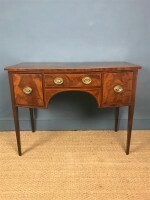 A George 111 mahogany Sheraton period dressing table or small sideboard circa 1780 with the original mercury gilt oval backplate and handles. 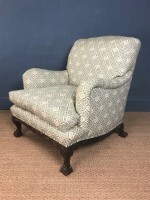 An Edwardian Ramsden model Howard and Sons Bridgwater armchair circa 1910 recovered in Howard ticking with original soft down sack back and cushion. Fully stamped to the back leg. Howard and Sons Berners St London. 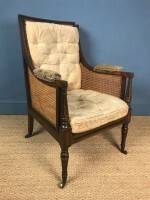 This stylish model in the classic Bridgwater shape is carved in mahogany with ball and claw feet in mid 18th c style. 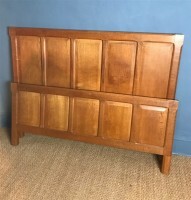 An early Gordon Russell oak bed c 1928 made by F Chilcott at the Russell workshops in Broadway. 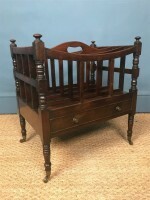 A George IV mahogany Canterbury circa 1825 in lovely original with no breaks or repairs. A Victorian painted pine Country House coffer with the original decoration c 1880. Having two frieze drawers below with recessed brass campaign handles sitting on castors. A West Country blue painted pine box circa 1850 in excellent original condition perfect for a coffee table or the end of a bed. 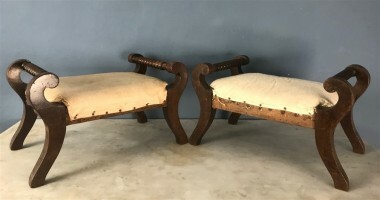 A pair of Edwardian leather library chairs circa 1915 with Plush down and feather cushions to the backs and seats. 36 inches wide 37 inches deep 31 inches high. A large Edwardian iron wood and leather club fender circa 1910. Read more: A large Edwardian iron wood and leather club fender circa 1910. A late Georgian Tamar Valley Painted Pine Dresser circa 1830 of Architectural form carefully scraped back to reveal layers of mottled original paint. 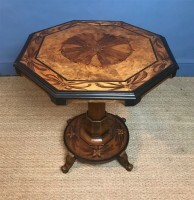 A mid 19th c Gothic burr oak octagonal library table in the Mannerist style of Anthony Salvin circa 1840.